Do you ever find a pattern that works and just make multiples of them? It’s not something I do very often. I’m very much a once I’ve tried it I want to take on a new challenge kind of gal so it’s only for really basics that I end up doing so. My current favourite to remake is my hack of the Tilly and the Buttons Arielle skirt. I basically just made it into a plain pencil skirt by taking out the wrap element and inserting a zip into the back. I just love the shape of this skirt. It fits my hips so well but I always found the wrap front a little fussy for my style. So this was the perfect way to get my my ideal skirt. 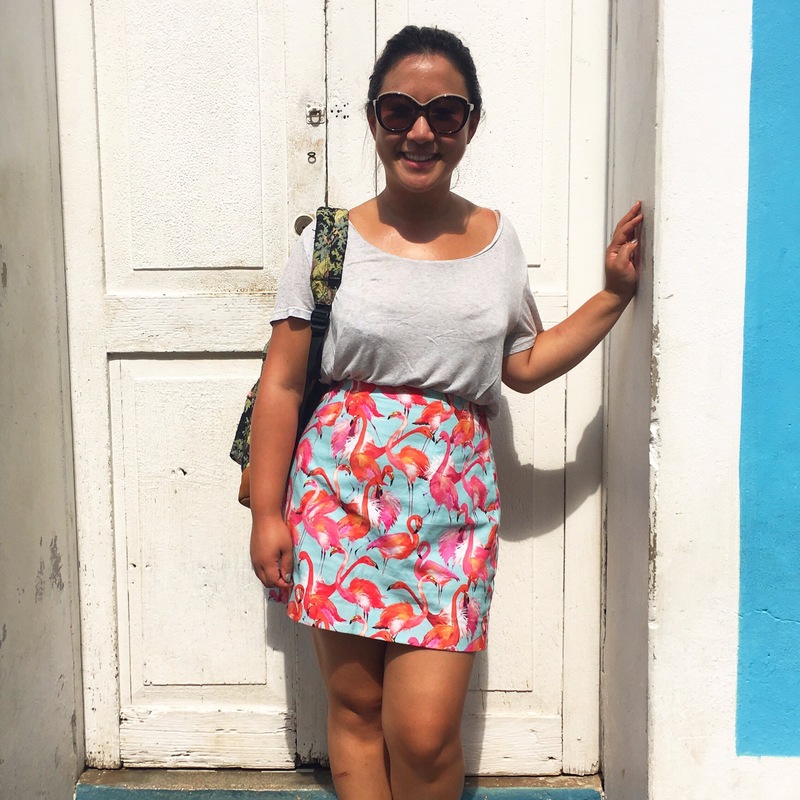 I originally made it out of a gorgeous flamingo fabric and it was my go to skirt for the summer! I ended up making a long version of this skirt out of some parrot fabric too! This is the same type of fabric as the flamingo skirt I made earlier this year. I picked it up from the Great British Sewing Bee Live event a few weeks ago. 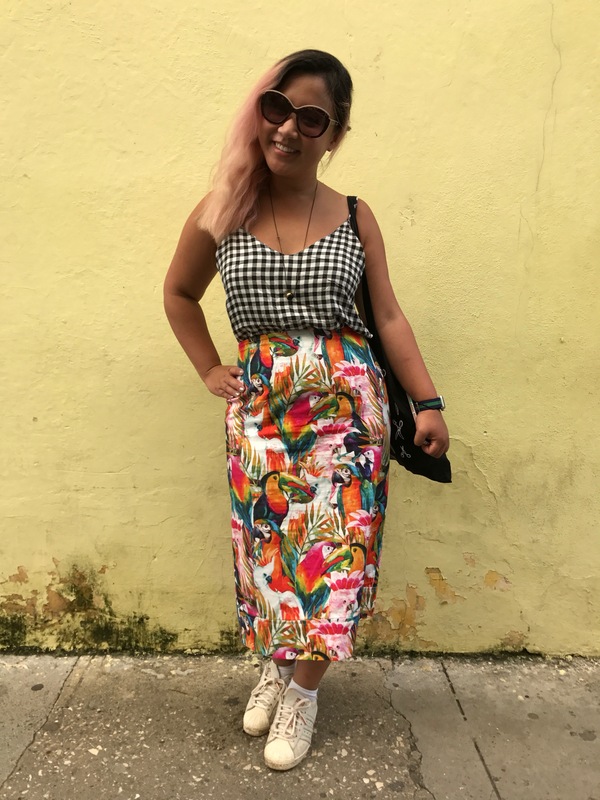 I made it in time to take on holiday to Cuba – you might have seen it on my Instagram page! I kept a big split up the back of this version to make it comfortable to walk in! My latest version is made out of a piece of remnant wool that I got from Malhia Kent in Paris several years ago. I could never decide what to do with that fabric so it has been sitting on my shelf for a long time! This skirt was a perfect choice though since I was so limited with the yardage. I literally had just enough fabric to cut it out! I’m able to cut this skirt out of 1/2 a metre of fabric so it was one of my only options for this fabric anyway! I love the result though I swear it’s come out smaller than my other 2 versions of this skirt. It’s definitely more fitted around my bum! I finished each of these skirts with a different type of zip which you can see here! I’ve tried a lapped zip, an exposed metal zip and an invisible zip. The invisible zip was definitely the easiest to put in (just because I’ve done those the most!) but I do like all 3 equally. It was good practice trying all the different finishes! 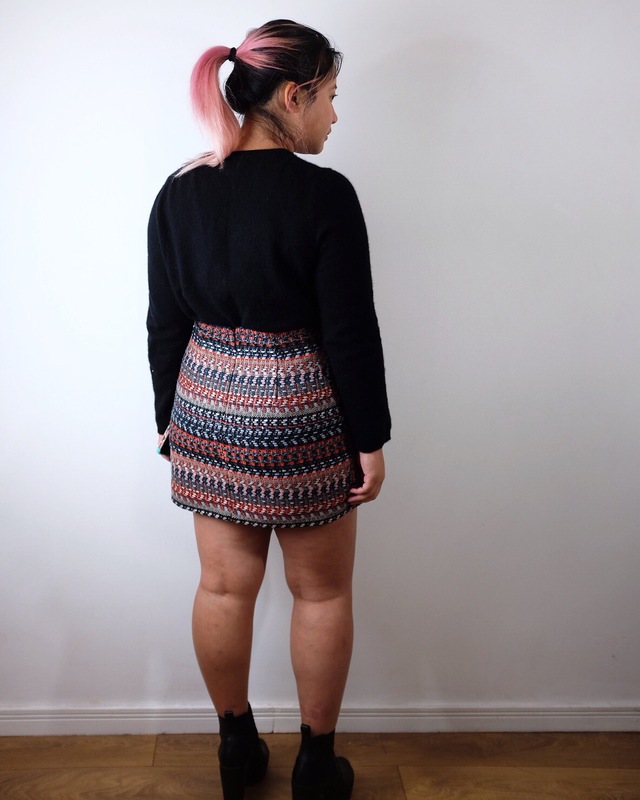 I’m planning a few more wool version of this skirt – some plaids and prints included! As you can probably tell my style for this winter is going to be all skirts tights and boots! Cute skirts. I have a couple of tried-and-true patterns like this. I am always torn between wanting to make something familiar and trying something new. I’ve found a few patterns that I’ll use over and over again, but I love trying new ones – it can be both exciting and a little intimidating. You did an excellent job with both skirts and should be really proud! Your exposed zipper is fabulous! 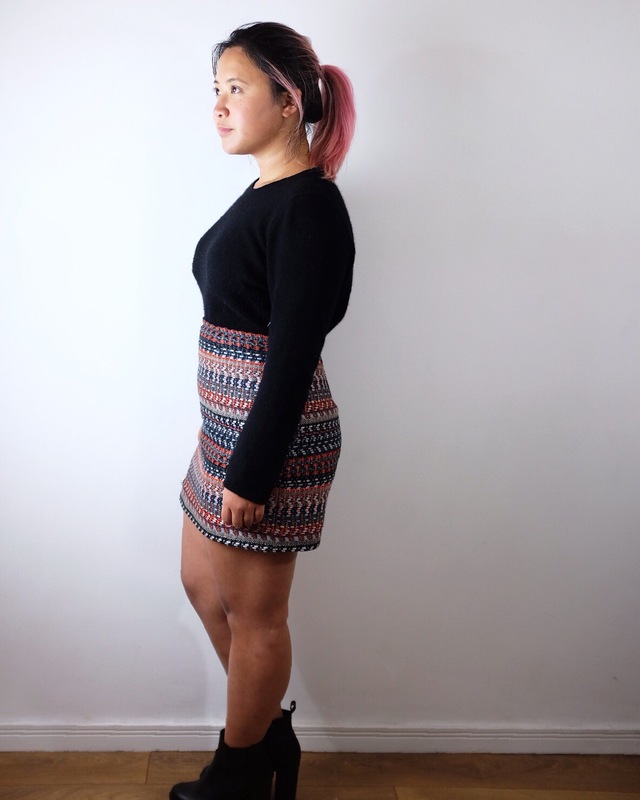 I have a very similar skirt pattern that I’ve made so many times… The skirts are beautiful! 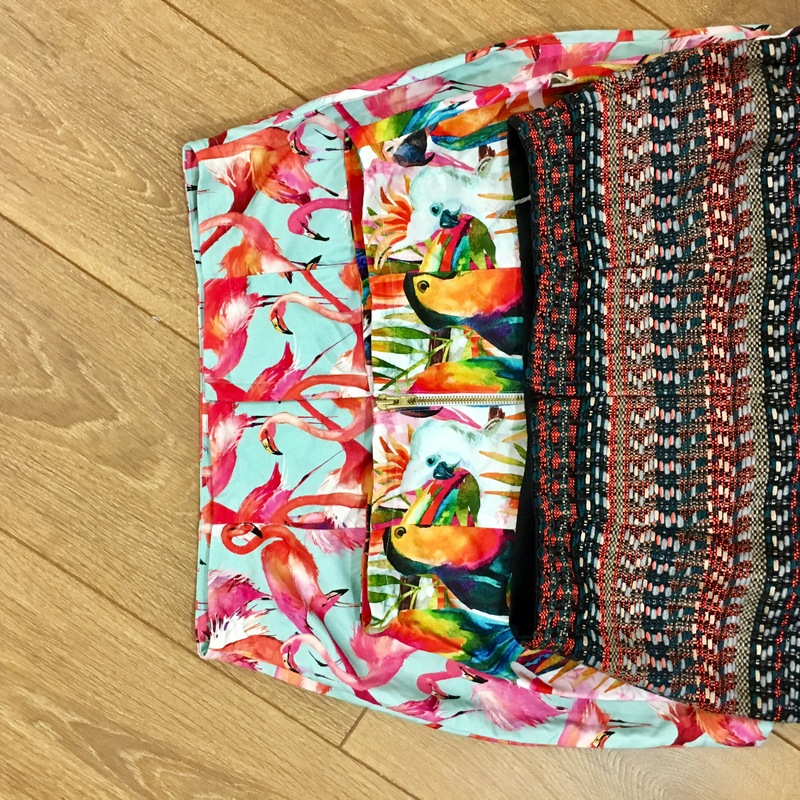 Your skirts are beautiful and you’ve inspired me to add some new ones in fun prints to my wardrobe.